Welcome to the new lovemin! I am so excited to finally reveal my new logo and website!!! It has been a long time coming, a lot of hours, and eyes-crossing, but it was worth it. From working with the amazing Jenny Highsmith who designed my lovely logo, to transferring from blogger to Squarespace, and building my website from the ground up, I have poured my heart into this new space. And I really hope you like it! Working behind the scenes for so long it has become my baby. And let's be honest, I want you to think it's the cutest baby you've ever seen! ;) But really, my prayer for these pages is not about you liking them or me finally being satisfied with the layout or design - my prayer is that through this space, and the words on the pages, the Lord's name might be known. He's the real heart behind lovemin (head over to the About page to get the full story), and He's the reason I write. 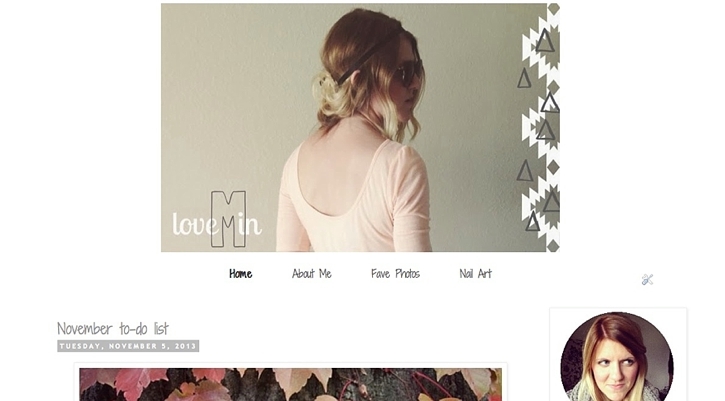 Looking back through old posts and previous looks of lovemin (see below), I can't help but celebrate how the Lord has transformed me through this journey thus far. Suddenly I feel as if I should have a glass of champagne in hand ready to toast... and if I did, I'd say, "Here's to transformation, big and small. To the journeys we never knew would shape us. And to the One who makes it all possible." So raise your glass (imaginary or hey go for it, pop a bottle) and celebrate with me! I can't wait to see what else the Lord has in store. Please stick around, check out transformation of lovemin and let me know what you think! I am so thankful for you - for the support, encouragement, and excitement that you share. Go ahead and giggle at me. Reading that, I’m laughing right along with you. As you might be able to tell, I had a slight obsession with Avatar. Seriously, I loved that movie. And for whatever reason, apparently I felt really connected with it at the time, hah. Besides giving myself a little laugh, looking back shows me how far my space has come, and how much I have grown since it’s beginning. Realizing that my blog was much more than just a random outlet - I decided it was time for a new name. I wanted it to be more than just what I was feeling at that time in life (Avatar, hello) and instead, be more of an extension of who I am. I wanted it to be true to me, who I want to be, and what I hope my blog will be. Looking for a name that did a good job of that, one that I wanted to be near and dear to my heart, took F.O.R.E.V.E.R. I’m terrible at naming things and wanted it to be just right. So, after much thought and many random ideas, lovemin found its way into my heart. I shared the unveiling with you back when I first named the space, but now that I’ve officially switched over with a new logo and made www.loveminblog.com my home- it feels like time to share the heart behind the name. a play on the idea of "love, Mindy"
my name is Mindy, but those close to me often refer to me as Min… meaning I'll get personal and be real with you on my blog. a play on sounding out the name as "love ‘em in" – as in, ‘love them in’ to the Kingdom. This last one is the one that sold me on the name, because it gets to the real heart of the reason that I write. Let me explain. I believe that God loves us so much that He sent his Son, Jesus Christ to die on the cross and save us from sin through His resurrection. And I believe that we have a loving God who He wants us to be a part of sharing His story and proclaiming His love with the world so that one day everyone might come to know Him. That’s a huge part of my heart, and ultimately the reason that I write- that’s the reason I live the way I do- And that’s my goal, to love others into His kingdom. That is why lovemin is so near and dear to my heart; it is a reminder that just as my life is not all about me, I don’t want this space to be either. It’s about loving others in to His Kingdom. Having that name smack dab at the top of my blog, in my url, on my business cards and what-have-you, is a good reminder of all that I want this space to be- and of the creator who shows me His love each and every day, even when I don’t deserve it. Sharing the heart behind lovemin , I hope that you have a greater understanding of who I am, and what you’re going to get when you visit this space. It is most definitely not going to be perfect, or clean-cut, or all about butterflies and roses, because life is messy and it is hard. But what you will find is this- words from a girl who writes from her heart, who will get personal and be real with you, and who wants you to leave knowing that you’re loved.